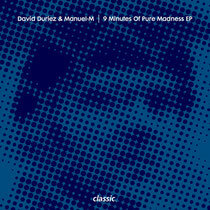 ‘9 Minutes Of Pure Madness’ finds the pairing of the Brique Rouge label head Duriez alongside fellow Frenchman Maunel-M for their first outing as a production duo. David’s back catalogue speaks for itself with over 200 releases on labels such as 2020 Vision, Freak n’ Chic and Ovum Recordings. Manuel-M cut his teeth in classical and jazz, only recently turning his skills to electronic music with his latest EP finding a home at Christian Smith’s Tronic Recordings. For their debut on Derrick Carter and Luke Solomon’s Classic it’s certainly a case of ‘doing what it says on the tin’. The ‘Disco Mix’ gets straight into it with a punchy groove mapped over kinetic percussion and an oscillating 303. The ‘Acid Mix’ crunches the 303 to deliver that classic wobbling acid sound patched over broken rhythms and shuffling drum patterns. It’s out now, check it out below.